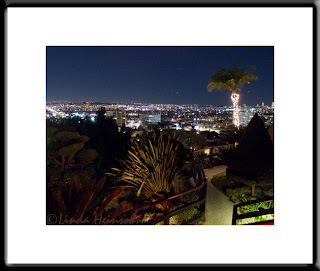 This is the view from the parking area at Yamashiro's Restaurant! It would have been a great time to have a better camera in my pocket! And a tripod. And an assistant. It was very windy and cold. Luckily I had a metal rail post to brace the camera on. You can still get a sense of how the Japanese garden of the restaurant overlooks an amazing view. What a place to enjoy a meal! That's LaBrea Blvd, I believe, stretching to the left. West Hollywood is in the near right. Westwood beyond.